All or None is a stark, desolate song, and more than any other number on Riot Act puts me in mind of the cover art. It surveys a broken, defeated planet, country, and self, and wonders what, if anything, we can do next. And ultimately there is no answer, which is what makes Riot Act both so tragic and ultimately unsatisfying. In terms of musical craft All or None is a fairly strong number—there is a richness and fullness underneath the primary guitar line, but it serves primarily to highlight just how desolate the soundscape is. Each strum rings out clearly against the silence, and the fills that punctuate the song sound alternately like sighs and tears, and Mike’s outro solo is weighted down with sadness and despair. There is emotion, but no real catharsis, because there is no way out. This quite possibly the loneliest song Pearl Jam has ever written (Thumbing My Way might top it, but TMW lacks the beauty and majesty found in All or None). The first part of the lyric is simple enough, lacking even the strength that comes from confrontation and discovery. Admitting this is not empowering the same way the dark revelations of Betterman or Rearview Mirror prove to be. You cannot emancipate yourself until you learn to see your prison, but sometimes the bars are solid and the locks are strong and there really is no way out. You’re left not with a prelude to redemption but a confirmation of failure. The baggage of an entire record, 14 prior songs, is nicely summarized in that one simple lyric. The second part of the line (the hopeless situation is what I’m trying to achieve) is a bit more challenging. There is self-recrimination here. He’s clearly on the verge of giving up, and chastising himself for it, for the acceptance of his new dark and dismal world. The chorus, therefore, is meant to be an affirmation—a call to arms, to still run on, despite the odds. It’s not quite as habitual as it is in Thumbing my Way, where he walks on thanks to muscle memory more than any conscious choice, but the lack of belief, or even faith, is apparent, and we’re left wondering why he’s even bothering. The fact that he uses the word try “I still try to run on” rather than the more determinate will “I will run on” shows the paralyzing doubt (compare this to the confidence and stubborn defiance in a song like Indifference) Even the emotional climax going into the final chorus is something of an anti-climax, his voice trying to take flight but finding itself grounded, unable to pull it off, and the wordless vocalizations that are his final contribution to the album are deflated, far too burdened by what he’s seen and experienced to be inspirational. And the record closes with Mike’s solo, one of his saddest pieces on record, gradually fading off into silence, no end in sight. There is no resolution, no hope, no fight, just a primal sadness directed at how far we’ve fallen, and the impossible heights we would need to climb to ever see light again. It’s a melodramatic conclusion perhaps, but Riot Act is a crisis of faith, the first time in the band’s history where they no longer had faith in the future, no longer believed that the fight itself could invest life with meaning. In retrospect this was all temporary, and looking back we can see the sparks of resistance are still there, buried deep perhaps but still alive, and ready to come roaring back to life with the explosive beginning to the self-titled record, the record the band HAD To make to follow up Riot Act, a reaffirmation in the face of the totalizing doubt of this record. We saw this shift begin almost as soon as the band hit the road—the feeling of solidarity that comes from being in a room with tens of thousands of people who share, if not your politics, than your heart—the communal good will that is at the core of the live experience—all of this gives you a foundation from which you can remind yourself that you’re not alone, that the darkness isn’t quite as permanent, quite as all encompassing, as it can sometimes appear. It was not an easy journey back, but it had begun. 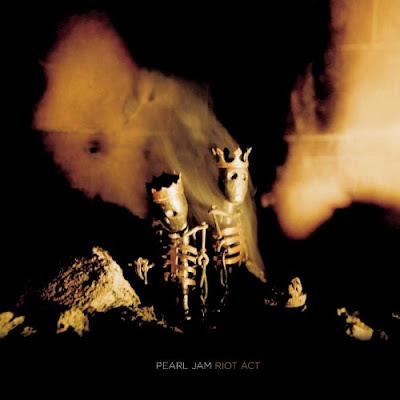 As a final ‘official’ thought, I clearly have a dark interpretation of Riot Act—the first moment in Pearl Jam’s catalogue where there is no light, or, more accurately, that the light that’s there is extinguished during the course of the record. I think it is important to pay attention to the way Riot Act was crafted in order to make sense of what the band wanted to do. They could have made it an album of redemption, but they didn’t. Songs like undone and down were left off the record because they did not fit, and by that the band really means thematically. They don’t fit because that is not the story the band wanted to tell. Had they chosen to end the record with Love Boat Captain or I Am Mine, or even You Are, it might make sense to go back and interpret songs like TMW and All or None slightly more optimistically, and of course we’re all entitled to listen to the record we want to hear. But I don’t think it is the story the band wanted to tell. They have an entire catalogue full of redemption. We don’t need to force it into the spaces that it was never intended to fit, and now that we know the ultimate story has a happy ending, there shouldn’t be a need.